Property 10: ANNEX Toronto downtown deluxe, 2 story, 2 bedroom, quiet, steps from everything. Property 16: Upscale--FREE: Wi-Fi + Prkg + Laundry + Binder of Shopping, Social & Good Eats! 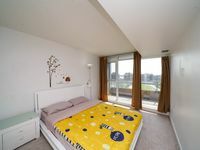 Property 22: A One Bedroom Main Floor Suite On Stanley Park In Toronto. Property 29: Beautiful Studio apartment across the lake in the "Beaches"
Property 30: Very friendly downtown neighbourhood: steps to subway, walk everywhere! Property 33: Luxurious And Modern Brand New 2 Bed Apartment! Property 39: Luxury Downtown Toronto Suite - Heart of Queen West- 20 min walk to CN tower! Property 44: LUXE Apartment in Prime Toronto Location! ★★★★★ (60+ Reviews) • Amazing Downtown Location • Easy Transit • Fast Wi-Fi! Property 46: ★★★★★ (60+ Reviews) • Amazing Downtown Location • Easy Transit • Fast Wi-Fi! Condo was easily accessible, very clean, lots of room. Amanda was very easy to deal with and provided options for our stay.